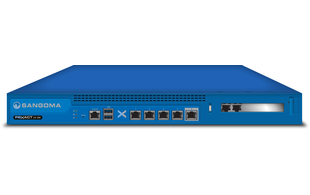 Sangoma PBXact UC System 300 is an extremely cost effective telephone system supporting mid-sized businesses and allows them to take advantage of the advanced VoIP telephony features. This system is licensed for up to 300 users/endpoints allowing for a total of 120 simultaneous calls. Its powerful hardware has an Intel Atom C2000 Octal Core processor with a 2 x 120GB (RAID 1) SSD and 4GB of RAM. There are 2 PCI express slots on the appliance which allow users to add telephony cards from Sangoma's range for PSTN connectivity.